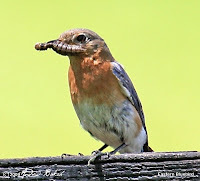 Early birding catches the worm at Jamaica Bay Wildlife Refuge? 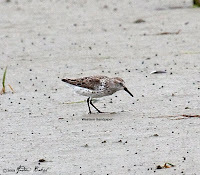 On Saturday, I headed out around 6:45 AM to Manhattan where I was joining 11 other birders for a birding trip to Doodletown, Bashakill and Shawangunks NWR. On the way in I realized, that I had forgotten to pack my binoculars. This is after checking and rechecking my bags several times. I just forgot to put it around my neck, which is where it usually goes as I keep it handy once I am outside. I was not happy, but comforted myself that I had my scope and thought that it would be good practice to do some birding by ear. 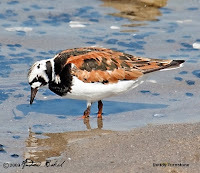 When I stopped to pick up our van, I called our trip leader Joe Giunta and told him my dilemma asking if he would check the Audubon office to see if they had any bins available. I got to Audubon around 8:30 AM and Joe did bring two binoculars he had borrowed from Audubon…they were old and not of good quality, but I had to make do with them. We boarded the van quickly and were on the road by 9:00 AM. Our first stop was Doodletown, Bear Mountain, NY. We got there with good time and upon entering the trail, picked up American Goldfinches and Cedar Waxwings. Further along the trail, we heard a Hooded Warbler, but did not get any looks. We continued on and picked up Indigo Buntings, Scarlet Tanager and a nice look at a Ruby-throat Hummingbird. We met a few birders who were on their way out and they told us where we could land Hooded and Cerulean Warblers, both target birds for us. 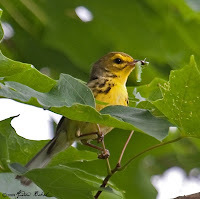 It was not long before we reached the spot and right on cue we heard a Hooded Warbler, while looking for that bird, a Red-eyed Vireo came into view and did a hummingbird type display in picking off an insect from a hanging branch. It was a neat display! While looking at the Vireo, a Cerulean Warbler came into view and we all had excellent looks at this bird. After enjoying the looks we continued on looking for the Hooded Warbler and we got it just a few feet away from where we had found the Cerulean. And what good looks we had. Right at that location we had a treat of finding an American Redstart nesting. Since we had landed the two target birds in that area, we turned and headed back down the hill. On our way back we heard a Yellow-throated Vireo and again the looks were very good for most of us. Shortly after, we took a lunch break and enjoyed the scenery while eating. At the lunch spot we picked up another bird in Louisiana Water Thrush. One of our attendees, John Sperling who happens to be a naturalist caught a Green Frog and we all had good looks at it. After lunch, we headed up Lemmon Road, where we found another good bird in Blue-winged Warbler. Heading back down Lemmon Road, we landed a Brown Creeper; Joe indicated that it was the first time he had found that bird at Doodletown and was quite pleased at seeing it there. We decided that it was time to head out for Bashakill and so we began the walk back to our van. On the way we picked up Eastern Phoebe and Great Crested Flycatcher. We left Doodletown and headed to Bashakill, which took about an hour. At Bashakill, our first stop was on Haven road where we parked and checked out the swamp. 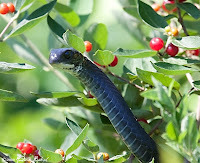 We quickly picked up Water snakes, Green Frogs, Eastern Kingbird, Great Blue Heron and Wood Duck. After awhile we got back into the van and slowly moved on towards our next stop, we had gone just a few yards, when Joe asked me to stop the van. 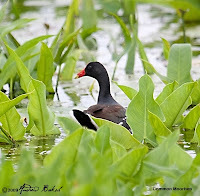 He had found another target bird, Common Moorhen. We all piled out of the van and had good looks. We then drove to another location that looked out into the swamp. 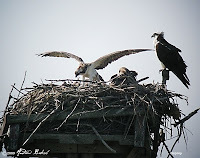 At that location, there were scopes on a Bald Eagle and Osprey nests. 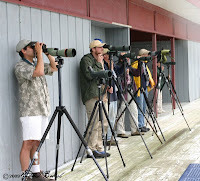 Those of us with our own scopes set them up and took looks at both nests. We then walked the trail in search of a few more target birds. The first one we landed was the Least Flycatcher. It was neat hearing the bird call and tracking it to its location. 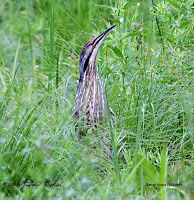 We then picked up two other target birds, a Virginia Rail that walked right into the trail ahead of us and one of my favorite finds of the trip, an American Bittern who we spotted poking its head out among the tall grass. 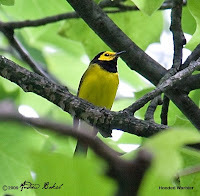 At that location, we also picked up Baltimore Oriole, Cedar Waxwings and Blue-winged Warbler. We tried for Orchard Oriole, but alas did not find any. We drove on further along Haven Road and picked up Yellow-billed Cuckoo, Chipping Sparrow, Rose Breasted Grosbeaks and many other birds. By then it was time for us to check into our Motel, the Days Inn. 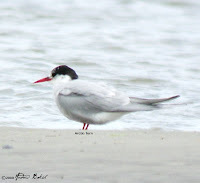 After checking in and freshening up, we headed out for dinner and some night time birding. Dinner was good at Danny’s...perhaps too good; we were looking forward to walking off some of the calories we had just piled on. When we were ready to leave it began raining and even though we gambled on the downpour subsiding, it did not and so after driving to a spot known for Whip-poor-wills and doing some flashlight searches from the van, we called it a night after about 20 minutes. The next day we were up bright and early. I was up around 4:00 AM, checking the list server for news on the Upland Sandpiper. I was pleased to see that two were seen and another two heard. 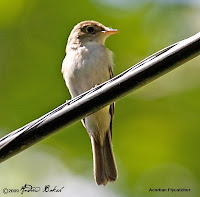 After breakfast, which was around 6:00 AM, we headed out to the D&H Canal and immediately after getting out of the van we landed another good bird in Alder Flycatcher. We then headed south along the newly mowed trail in search of another target bird in Golden- winged Warbler, along the way, we picked up Black-billed Cuckoo, Pileated Woodpecker (flyover) Belted Kingfisher, Veery, Wood Thrush, Baltimore Oriole, Tufted Titmouse and finally the Golden-winged Warbler. This bird gave us spectacular views at eye level and we all had great looks. We turned back at this point; on our way back we picked up Eastern Bluebirds and a Downy Woodpecker. 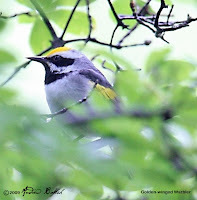 At the van we headed in the opposite direction we had been and on that trail, we picked up several new birds for the trip, including Pine Warbler, Chestnut-sided Warbler, Field Sparrow and Barn Swallow. 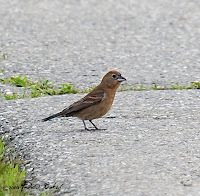 We also had several repeats, including Rose Breasted Grosbeaks and Blue-winged Warbler, to name a few. We left the Canal, and headed towards Gumaer Falls Road. Here the habitat was different and more suited to Warblers. We picked up several more target birds including Black-throated Green Warbler, Blackburnian Warbler, Black-throated Blue Warbler, Acadian Flycatcher, Winter Wren, and a surprise bird in an Olive-sided Flycatcher. John Sperling, continued to share his knowledge with us by pointing out several plants and showed us a Red eft. After about an hour of birding we headed back to the Motel and checked out. We then stopped at a local deli and picked up lunch. We ate at the location on Haven Road we had visited the day before where the scopes were setup for the Eagles. The scenery was nice there and it was nice to visit it one more time before we left. 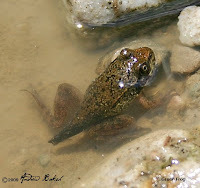 While eating, we saw a nice Purple Spotted Butterfly in the parking lot and John Sperling and I relocated a Baby Green Frog, which was we found in a puddle in the parking area. 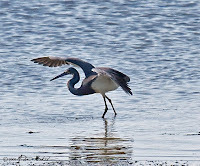 After lunch, we drove to our last venue, Shawangunks NWR. We stopped first at Blue Chip Farms in our quest for the Upland Sandpiper. After about an hour searching we found the bird…or birds I should say. The views were all scope looks as they were way out and not easy to keep track of as they kept moving. 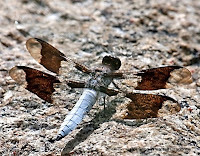 We noted 2 adults and 2 young. Everyone all had decent looks and for some, it was a life bird. 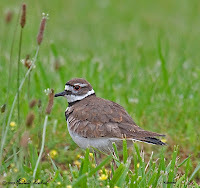 We then left for Shawangunks NWR, where we were after some grassland birds. As soon as we walked into the trail at Shawangunks NWR, we picked up another target in Willow Flycatcher…interestingly on a Willow tree. While enjoying the looks, we heard the song of an Eastern Meadowlark and quickly diverted our attention. 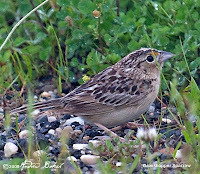 While enjoying the view of the Meadowlark, in flew a Male Bobolink. We all had great looks. By then it was around 4:30 PM and Joe decided that it was time to wrap it up. On our way out we picked up another new bird for the trip in Common Raven. We boarded our van a tired, but happy group. After one stop for drinks and a bathroom break, we drove non-stop back to NYC arriving at Audubon around 7:15 PM. I dropped off the van and got home around 10:00 PM. It was an excellent trip getting to see some really nice birds and meeting nice people. After a few cancellations for one reason or another we finally got the team together on Tuesday, for our first Barn Owl banding outing for the year. Most of us began assembling at Don’s house around 11:00 PM. It turned out to be a larger group than I expected with a couple of National Park Rangers, Jessica and Maryjo joining us. Some folks decided on getting lunch before we started and that delayed us a bit. Eventually, we hit our first site around 12:30 PM. Here, our first box turned up empty; however, we did find a nest in the box and speculated on whether the source could have been a Wood Duck. Photos were taken and there will be follow-ups and reviews to determine the source of the nest. If it turns out to be a Wood Duck, it would be a record for that area as there is currently no data of a Wood Duck ever nesting there. 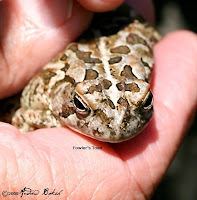 Along the way to our second box, I spotted a Fowler's Toad moving along the edge of the trail and alerted Don, since my hands were full. Don, caught the toad and the group all got good looks; it was for some the first time looking at this type of toad. We eventually got to our second box, which turned up one un-banded adult Barn Owl with two eggs; we went through the process of quickly banding her and letting her get back to her eggs. By then, I had to leave and the team went on to the third box at that site. I rejoined the team around 3:00 PM and learned that the third box could not be accessed due to some fashion photo shoot that was taking place at the location. Good thing I was not there because I would have had a hard time not pressing for access to the location...but the fashion photographer had permits, so they probably would have won out. 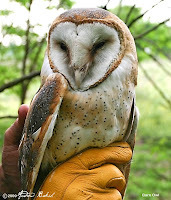 Anyway, the team had since then moved on to site number 2 and there they had one box with two adult Barn Owls, one which flew out before the nets could cover the entrance; the other adult was un-banded and so the team went through the process of banding that adult. I joined the team for the third site. Unfortunately, the weather began to turn for the worse and so we headed back to Don’s house (thanks to Meera for making a good call), to wait it out. During that time, the team got smaller as 4 people dropped out including the NPS rangers. We kept checking the weather conditions and around 6:00 PM, with the rain down to a drizzle, we headed back out with the team down to now 6 of us. At the third site, our first box had one un-banded Adult with 2 eggs, and we again went through the banding process. At box number 2 we had our first Owlets. Three lovely, healthy babies, who were old enough to be banded. After banding, we took some photos along with pellet samples and headed on to box 3. This was one of the boxes that Don, Doris and I had put up earlier in the year and I was eager to see if it had Owls. Unfortunately, the nest box was empty; the good news is, we found lots of pellets inside, which is a good sign that this box could in the future be occupied with a nesting pair. There was one more box at this site, but we passed on it because of the fading light and weather conditions and headed back to Don’s house. During our stint at site three, we came across several Herring Gull nests and chicks and had to be extremely careful not stepping on any nests. I am happy to report that the walk to and from the location was incident free. It was a good first outing and we are already looking at scheduling our second outing as quickly as we can during this breeding cycle. 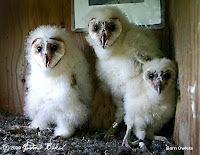 Please note that this post was written in a way, so as not to reveal the sites of the Owl boxes. This is for the protection of the Owls.